Want to find people from your target audience? Want to find your friends? Want to find people who share the same interests as you? Look no further, because, in this article, I’ll present The Ultimate Guide To Finding People On Instagram and the different methods you can use. Note that not all methods won’t work for all groups of people. With these methods, you can find all types of people: friends, your target audience, people with similar interests, and so on. But note that all methods won’t work for all types of people. Some will work for all, some will work for only two, and some only for one particular group, but don’t worry though! I’ll tell you exactly which methods are best for what. Hashtags are great tools to discover people. It is great for everything except if you want to find friends. It is not impossible, but it will be difficult, because what should you search for if you’re looking for your friends? Hashtags are especially effective if you want to find people who are within your industry or people who are interested in the same things as you – regardless if you’re a business or not. Let’s say that I am Interest in tennis and want to find people who are also interested in the same thing. In that case, I would simply type in the keyword “Tennis” and tap search. 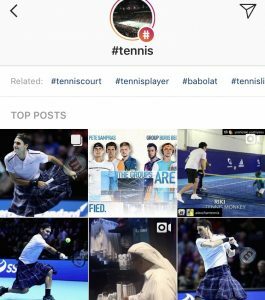 What is also great is that Instagram then presents a list of related hashtags based on the one you searched for which allows you to find more people and more content based on your interest or needs. If I want to find potential customers to connect with, who show an interest in the products I sell or industry I am in, I simply search for a keyword related to my industry or brand and then tap search. I do so by tapping the magnifying glass icon located at the bottom of the screen to the left and then selecting hashtags at the top. If you have connected your Facebook account with your Instagram account, you will get a list of all the Facebook friends you have that have Instagram – as long as they have connected their Instagram account with their Facebook account. If you haven’t yet connected your Instagram to your Facebook account, you can do so now, if you’d like. Tap the profile button in the bottom right corner of the screen and you’ll be taken to your profile. From here, tap the cog wheel (settings) button in your profile. 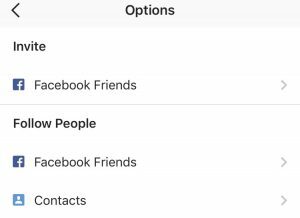 You also have the option to invite your Facebook friends, and what this does is send a notification to all your Facebook friends letting them know that they can find you on Instagram. To find your Facebook friends, tap “Facebook friends”. If you haven’t connected your Facebook, you’ll see a button where you can connect your Instagram account. If you have, however, already connected your Facebook account, you’ll be presented with a list of all your Facebook friends that are on Instagram. 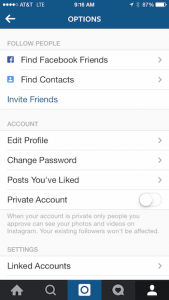 Through the same method as above, you can find people on Instagram, only that you select “Contacts”, instead of “Facebook”. What this does is find people who you have in your contact list that has used the same phone number on their Instagram account when signing up and completing their profile. If you haven’t connected your contact list with Instagram, you’ll get, just like Facebook, an option to connect your contact list. If you already have connected your contact list, you’ll be presented with a list of users that you have in your contact list on your phone. Last but not least, from the same menu as Facebook friends and contacts, you have suggested profiles. If you want to access this menu a bit quicker and easier, you can go to your profile and tap the “Discover” icon. The icon is a silhouette of a person with a + next to it. You can find this icon in the top-left corner of the screen (iPhone) or near the top-right corner of the screen (Android). By tapping on this, you’ll be presented with a list of profiles based on your interests and current follows. Right below the name of most accounts, there will be a very brief “explanation” to why Instagram has presented that account there. This method will allow you to find people who are related to your page and your interests, and therefore, it can present both potential customers as well as friends, friends of friends, or people who are in the same industry and niche as you. Just scroll down the list until you find profiles you are looking for. In the search bar, you can search for locations. This means places that people have “checked in to” when uploading their post. This way of finding users is especially useful for brands who are looking for people within your target audience, but it is also great if you want to see the posts of accounts that have been to the exact same location as you. Maybe you want to see the place from their point of view and connect with them. With this method, I can do so much more than finding people who might have an interest in my business. I can identify things that people are complaining about at McDonald’s, and in that way improve my very own business. If I want to promote my business, I can engage and approach the users I find and let them know about my restaurant and that I saw that they liked hamburgers. To further increase interest, I might even give them a special discount code. This method falls under “Search & Explore” which is a section on Instagram that allows you to search for hashtags, locations, and users. In other words, it is Instagram’s own integrated search engine. 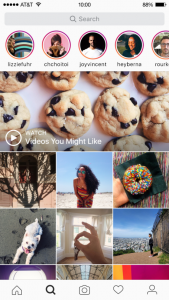 The search and explore section also includes an”Explore page”, as the name suggests, where Instagram presents content from around the platform that they believe you will find interesting. I’ll go more into detail on this further on. I’ve already spoken about the search tool for hashtags and locations, but this time, we’ll use it to search for accounts directly. With the search bar in the S&E, you can search for users using a name, or search for their username directly. Of course, this method demands you to know their username from the very start, and therefore, it is not very effective if you are looking for users you are not already aware of on Instagram. The search feature bases its results on two things: username and name. Let’s say that I am searching for Connor McGregor. His username is not his real name which you would expect a celebrity to have, so technically, if you would search for his name in the search bar, you wouldn’t find his account since his username is @Thenotoriousmma. And if you don’t know that his username is just that, how would you know what to search for? 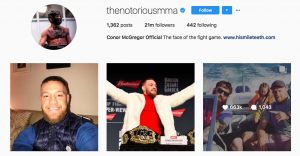 But McGregor has written his name in his profile description (in the section that says “Name”) when setting up his account, thus allowing people to find his account by searching for his name – even though his username isn’t his name. What this essentially means is that with the use of Instagram search, you can find people by searching for their name, even though their username isn’t their real name. And as you probably know, the majority of people don’t have their full name as their username. Some might use their nickname, others might use an abbreviation, others just part of it, and some not at all. In other words, by using this feature, you can find almost everybody on Instagram that you are looking for (except if their name isn’t in their profile and you don’t know their username). Again, this makes this feature only helpful when you actually know who you are looking for. If you are looking for people with the same interests as you, you can go through the posts presented in this section. 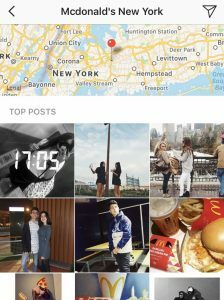 The explore page is found at the same place that you went to search for hashtags, accounts, and locations. In other words, by tapping the magnifying glass located at the bottom slightly to the left of your screen. Here, you will be presented with posts that are related to your page. The posts presented there are presented using a complicated algorithm that looks at the people you follow, your previous interactions, previous searches and much. Based on that information, Instagram presents posts that they think you will find relevant and interesting. This is similar to how the content in your regular newsfeed is presented, using an algorithm, only that the content presented in the Explore page isn’t normally from people who you are already following. With 800 million active users, finding particular people on Instagram can be like finding a needle in a haystack. However, with the right methods and tricks, finding the people you are looking for can be done in a heartbeat. With so many people being on this platform, Instagram can be used as a tool to find virtually any type of people from all around the world.